Libya have withdrawn as hosts of the 2017 African Nations Cup finals as ongoing fighting in the country delays plans to build new stadiums for the 16-team tournament. 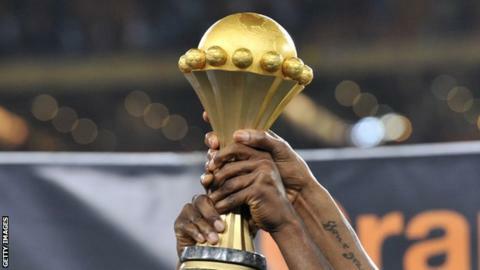 The Confederation of African Football (Caf) are inviting new bidders for the tournament. Caf say that countries wishing to host the tournament have until 30 September to express their interest. A decision on Libya's replacement will be made next year. African football's ruling body also state that because of the limited time left to organise the 2017 Nations Cup, the Caf Executive Committee will select a host country who can guarantee that accommodation, transportation and hotel facilities, as well as training sites and stadiums already exist. Libya has endured weeks of recent chaos as the government struggles to control former rebel groups who helped topple former leader Muammar Gaddafi in 2011. Libya were originally scheduled to hold the Nations Cup in 2013 but because of the civil war swapped with 2017 hosts South Africa. The north African country had been planning to build 11 stadiums at a cost of $314 million, including a showpiece new 60,000-seater Austrian-built stadium on the site of a former military camp in Tripoli. Benghazi and Misrata were also set to have new major stadiums. Libya's government said last year it hoped the hosting of the Nations Cup would allow it to demonstrate that life had returned to normal in the country and encourage investors. Former World Cup winner Franz Beckenbauer had accepted a role as an "ambassador" to help promote the tournament and the country and the former Spain coach Javier Clemente was hired to prepare their team for the tournament. Caf's decision follows the visit of a delegation from the Libyan FA to Caf's headquarters in Cairo this week. Libya also delayed the scheduled start of their new league season earlier this month because of the fighting while teams competing in international competitions in recent months have been holding home matches in neighbouring Tunisia. In February, Libya claimed their first senior African title, winning the 2014 African Nations Championship (CHAN), a tournament they were originally set to host. The civil unrest in the country meant that the event ended up taking place in South Africa instead. Caf are due to decide the host countries for the 2019 and 2021 Nations Cup finals at a meeting in Addis Ababa on 20 September. Algeria, Cameroon, Guinea, Ivory Coast and Zambia are bidding.